Ambrose, Stephen E., “Undaunted Courage,” (New York: Simon & Schuster, 1996), p. 13. National Wilderness Institute, “State by State Government Land Ownership,” 1995, (www.nwi.org/Maps/LandChart.html). U.S. Department of Agriculture, National Resources Inventory, 1997. Anderson, Terry L. and Leal, Donald R., “Free Market Environmentalism,” (New York: Palgrave), pg. 4. Stroup, Richard L., “Economics,” (Washington, D.C.: The Cato Institute), pg. 74. “Fifteenth Annual Report of the Council on Environmental Quality,” (Washington, D.C.), pg. 364. U.S. Department of Agriculture, Economic Research Service, “Major Uses of Land in the U.S. (Washington, D.C.), 1997. An area with a population density of more than 1,000 people per square mile and connected to a city, township or village with a population of at least 2,500 people. Areas with either a minimum population of 50,000 or an urbanized area plus a total metropolitan area of at least 100,000. U.S. Department of Agriculture, National Agricultural Statistical Service. U.S. Department of Agriculture, Economic Research Service, “Major Uses of Land in the U.S.,” (Washington, D.C.), 1997. See Yandle, B. Vijayaraghavan, M., and Bhattarai, M., “The Environmental Kuznets Curve: A Primer,” (Montana: PERC), May 2002. Morril, R.L., “Myths About Metropolis,” in J.F. Hart (ed. ), “Our Changing Cities,” (Baltimore, Md: Johns Hopkins University Press), pg. 11. Cox, Wendell, “From Never-Never Land to Shangri-La: The Livability Fantasy,” (Chicago: The Heartland Institute), 2002. Cox, Wendell, “Property, Prosperity and Poverty: Trends and Choices in Land Use Policy,” (London: The Institute of Economic Affairs), 2002. Norris, P., Harvey, L.R. , Deaton, B.J., Savard, M.A., “Can Use Value Assessment for Property Taxation of Agricultural Land Protect Environmental Amenities?,” (Lansing, Mich.: Michigan Department of Environmental Quality), May 2002. 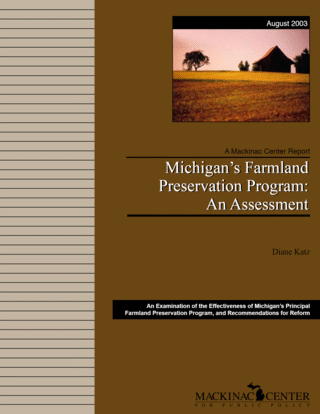 Hoffman, S.A., “Farmland and Open Space Preservation in Michigan: An Empirical Analysis,” (Ann Arbor, Mich.: University of Michigan Journal of Law Reform), 1986. Wang, Y., and Libby, W.L., “Purchase of Agricultural Conservation Easements and Other Farmland Rights: Evidence on Price and Willingness to Supply,” (Columbus, Ohio: Ohio State University). Eagle, S.J., “Conservation Easements and Private Land Stewardship,” (Washington, D.C.: The Center for Private Conservation), 1998. Tax credit totals may exceed the number of farms because property owners have re-enrolled in the program over multiple years, and because the Department of Treasury routinely rounds up to the nearest 50 the number of credits awarded in each county each year.